/ ¿El ateísmo lo envenena todo? The Loss of Juárez How Has the Violence in Juárez Changed Border Culture? It is said that a new atheism garnered strength in the aftermath of 9/11 as a response to the palpable fundamentalism put forth by Muslims and Evangelists. Said movement counted on the backing of intellectuals and scientists such as Christopher Hitchens, Richard Dawkins, Sam Harris and Daniel Dennett. However, taking a moment to observe the history of spirituality in the Western world, we find that there have been counter-religious trends since our earliest beginnings. More relevant to this discussion, after Karen Armstrong, a nun who was excommunicated by the Vatican, published her book A History of God in 1993 (which would go on to shoot up The New York Times’ Bestseller list), one could find people already beginning to make a movement out of this “New Atheism.” For this reason, speaking of a “New Atheism” can clearly be categorized as a trend rather than a new historical event. 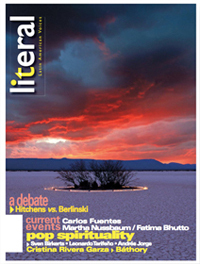 In that sense, what we can witness in this issue of Literal is what Steve Birkerts referred to in his essay entitled “Serendipity” as Pop Spirituality. In other words, rather than offering a number dedicated to “New Atheism,” we present a brief encounter with the expressions of consumerist spirituality that have become commonplace in our lives. We also present three conversations with three distinguished figures of our world: Carlos Fuentes, Martha Nussbaum and Fatima Bhutto, who analyze social participation through the lens of one who searches for certainties. Se dice que un nuevo ateísmo ha cobrado fuerza en el mundo anglosajón tras los trágicos acontecimientos del 9/11, como respuesta a los palpables fundamentalismos musulmán y evangélico. Dicho movimiento estaría respaldado por intelectuales y científicos como Christopher Hitchens, Richard Dawkins, Sam Harris y Daniel Dennett. Sin embargo, desde que Karen Amstrong, una monja excomulgada por el Vaticano, publicara su libro A History of God en 1993 (y que llegaría meteóricamente a las primeras listas de The New York Times), ya se percibía en el ambiente una tendencia francamente inclinada hacia este “New Atheism”. Ahora bien, si nos detenemos a observar la historia de la espiritualidad occidental, se pueden rastrear movimientos contra religiosos desde nuestros orígenes. Por lo mismo, hablar del surgimiento de un nuevo ateísmo parece más una cuestión de moda que realidad histórica. Basta echar una mirada al pasado para comprobarlo. En ese sentido, lo que presentamos en este número de Literal se acerca más a lo que Sven Birkerts, en su ensayo “Serendipity”, define como Pop Spirituality. En otras palabras, antes que ofrecer una edición dedicada al “New Atheism”, intentamos más bien un breve acercamiento a las expresiones de la espiritualidad de consumo que hoy ocupan la vida diaria. Presentamos también tres conversaciones con figuras destacadas de la actualidad: Carlos Fuentes, Martha Nussbaum y Fatima Bhutto, quienes analizan la participación de la sociedad como agente activo y determinate de un entorno en búsqueda de certezas.